This is part of my novel. You can start at the beginning here. I almost didn't feel the water. From the corner of my eye I saw Father's scowl deepen and I knew I was going to be trouble. If knights bound to a different Lord could get in trouble. All that mattered was I'd done it. I'd done what Gepilios had said I could do: claimed a year of freedom under the King's code. Many didn't ask for such. It was an old law, put in place more for the sake of the quests then the questers. But the old quests were mostly rumor now, and held no monetary rewards, so many people didn't invoke this vow. I didn't care about money. I'd chosen this route for me, and me alone. To give me time to become Riol-knight and forget Riol-prince. A year wasn't a lot of time, but it would have to be enough. Because I knew if I failed to present myself before my new Lord at the end of this year, I'd be hung for treason. And Serving a new master certainly was better then being hung by one, that's for sure. I raised my head. Father was nearly to the podium now, his face frozen into the mask I knew so well. Strangely, I felt so light. I looked down at my hands and noticed they were trembling. "Your Highness!!" A squire, his face red and sides heaving suddenly burst into the chapel. "The Princess, your daughter--Miera--is missing!" Everyone froze. My father, always moving, the perceptual forward-thinker and plan-implementer, also froze, his jaw half open. I watched as a little bit of drool escaped his lips and dribbled down his beard. I suppose he was reordering his thoughts from wayward son to missing daughter. I might have chuckled if I hadn't been still standing next to the priest. Father finally closed his mouth. "Well, FIND her. Check the library. She can't have gone far." The guard gulped. Visibly. Uh oh. He must know my father well. "Well..your highness...theirs more to...perhaps we should talk in private?" "Out with it, you blundering idiot!" Roared the king. "Well, you see...she left all her clothes...not even an undergarment is missing..." The poor squire's face turned an even darker shade of purple, "It is said...Your Excellency...well...she seems to have absconded in only her nightgown" His adams apple bobbed once, like the frightened glare of a deer who has just realized he's stumbled into a lion's den. "It is feared she has run off with a lover." Our of the corner of my eye I saw Gepilios, his face wrinkled with suppressed laughter. "WHAT?" My father yelled, his neck bulging. "FIND HER NOW!" Gepilios hurried forward. "Your highness, I'm sure it is nothing so dire. The girl is probably with one of the other ladies or simply lost in a book. You know how she is." His hurried explanation seemed to only further enrage my father. "I swear I am going to marry that girl off as soon as she's found, lover or no lover." He growled. "I'll probably have to double the damn bride price now, due to the rumors that she's been tainted." "Don't forget your place, Magus!" Thundered my father. "If the girl isn't found by night the only thing she'll be good for is the nunnery." Gepilios bowed at once, his eyes meeting mine. Why are you still here, his face seemed to ask. Yes, that's right, I'd better be off before Father thought to remember me. The servants had already scattered, dispersed like leaves in the wake of the King's temper. A few nobles were standing far enough away to be inconspicuous, but still close enough to hear the gossip. In a few hours the tale of Miera the trollop would be all over the castle. If I didn't have to leave immediately for my quest, I'd be rather interested in where she'd gotten off to. I couldn't imagine Miera with a lover. She'd claw him to death first with her nosy attitude. Or whine him into oblivion. It was nearing dinner when I finally made it to the stables, my traveling bags a heavy weight under my arms. All my things were clearly stamped with the Knight's insignia, as were the rest of my possessions. 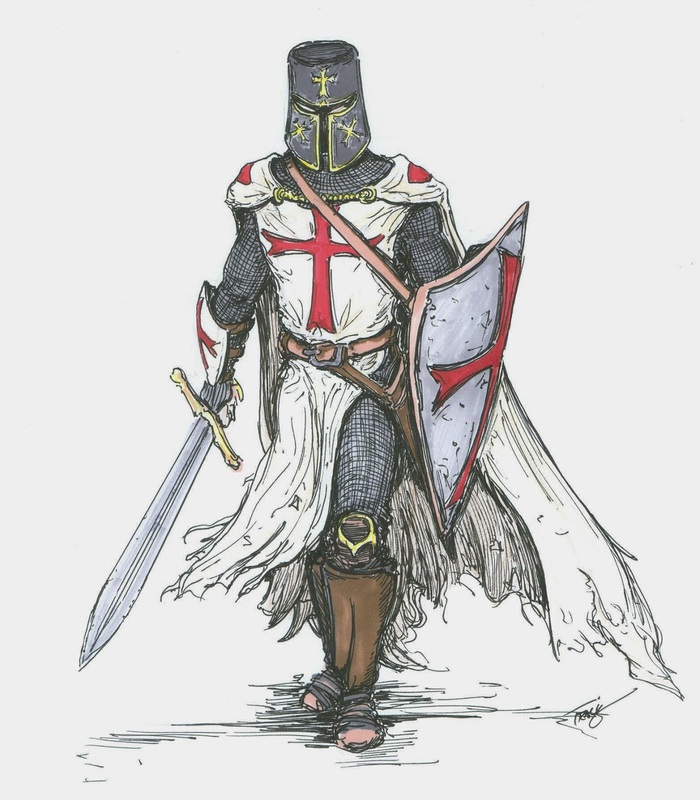 It was illegal upon penalty of death to steal from a knight, so all our gear and clothing were marked with large red crosses. It was also illegal to steal from a monk, but the sentence for that crime was six months of charity. Not that monks usually owned anything worth stealing. I had been told my horse would be in the last stall. I dropped my gear, fiddling with the latch. The door swung open slowly. I grabbed my tack and bridle, reaching with a free hand to guide the horse out. My horse was named Cyernn--after the great Lord Cyernn who was my great, great grandfather--but I mostly liked the name because it also meant "cake" or "sweet pie" in the old tongue. Yes, I named my horse after a pastry. It works. When I turned around Miera was standing behind me. Her face was all red and splotchy with tears and she was wearing some kind of maids gown and cap. I guess she really had been trying to sneak out with some lover. "What are you looking at?" She said, the words pulling her mouth up into a neat little pout. Hah. So, still the Miera I knew. "Uh...Hi." I said, and began to groom my horse. "Riol..." She started, to my back. "Look, Miera, don't involve me in whatever love affair you've got going on. I'm about to leave, if you hadn't noticed." Maybe she had known, and that's why she'd tried to run off on the day I was so conveniently being given the heave-ho. "Rioooollll!" She squealed, high pitched and whiny. Something hit my back. "I hate you and ugh why are you such an idiot." Typical Miera behavior. Always trying to blame all her problems on me. I hoisted one of my packs and began to secure it to my horse. "It really isn't my fault if he was caught, Miera." I could see her, still seething over my shoulder. She had one of her shoes in her hand. Guess that was what had hit me earlier. "Oh, I never!" She wailed, and flung herself on the ground. A few of the horses shifted in their pens. "I don't have a lover, I haven't run off, and I only donned this stupid itchy dress so I could say goodbye to you!" "And now Father wants to marry me off to Getel's snotty son..." More sobbing. I set down my last pack, suddenly worried. Getel's son was nearing thirty, and he'd already had two wives. "Uh, wow. So, does that make me your secret lover?" I joked, glad to see her glare resurface. Mad Miera was one thing, but a soggy, forlorn Miera was just depressing. It couldn't be true. Father wouldn't be that mean, would he? "Gepilios said I should go with you." She said, at last, as I finished with the horse. "He said he'd meet us outside town with a cloak and some new clothes for me..."
"Miera...you can't be serious." From the totally dejected look on her face, I could tell that at least this wasn't her idea. Perhaps I could still talk her out of it. "For one, can you even ride a horse? And two, women don't travel. Ever. Especially not alone. You'll get hurt. Or you'll starve. You don't know how to hunt, or start a fire...or..." Mentally, I started going through the list of all the things I'd been taught in training. Her eyes welled up with tears again, but I kept going. There is no way I was taking my sister with me... no matter how much I loved her. "Princesses stay in castles. They get married and make more princesses. You've known that since the day you were born." "Oh, right." She said, "I'll just smile and behave and keep doing what Father wants me to do while you get to run off and have adventures like a normal person...."
"What?" I felt angry now. Didn't she know I'd give anything to be in her place? To be courted and wooed, pampered and loved for the rest of my life? "Do you think I want to be a knight? Do you think it's fun to watch all the girls swoon over Olix and know that I'll never have what you'll have? I can never marry." "I know that." She said, "Your so lucky." "Lucky? Lucky? I'm lucky that I get to spend the rest of my life by a campfire in the rain, patrolling and perhaps dying for some Firstborn in silks..."
Two hallways down, the stable door slammed. We both jumped, leaving me staring at her, her green eyes puffy and red and her cheeks flushed belligerently. I guess I had never considered that perhaps she felt as trapped as me. "I'm coming with you." She said, and I could see the steel in her eyes despite the anger. And if there was one thing I've learned about Miera--she never backed down once she'd made up her mind.